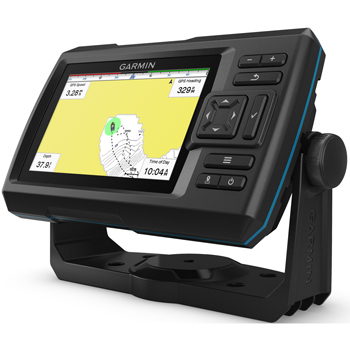 Compact and Affordable, the STRIKER Plus 5cv from Garmin offers a bright, keypad controlled 5" display with built-in Quickdraw contour software enabling the user to create and save up to 2 million acres of HD fishing maps with 1' contours! Simple to operate and install the 5cv comes with everything you need to get out on the water. A CV20 Transom Mount transducer provides CHIRP Sonar and CHIRP ClearVu for the best clarity and images while also creating custom HD Fishing maps thru QuickDraw Contour Software. Simple to use and FREE - Quickdraw software instantly creates HD Fishing maps that you can view immediately on your display. You can save these maps for yourself or share with others within the Quickdraw community! With CHIRP Sonar you will see crisp clear fish arches and exceptional target separation while the CHIRP ClearVu provides near photolike detail of what's going on below your boat! 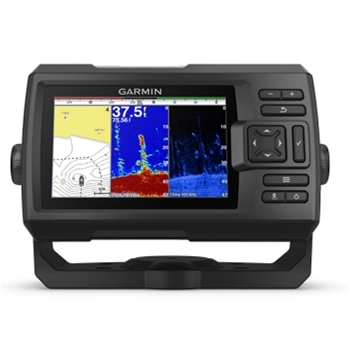 Rugged and Waterproof to IPX7 standards, the STRIKER plus is a top contender in fishfinders and even adds an internal high sensitivity GPS for waypoint marking and boat speed. Garmin Flush Mount for STRIKER 5dv/5cv and STRIIKER Plus 5cv Fishfinder. Includes mounting hardware, instructions and template. 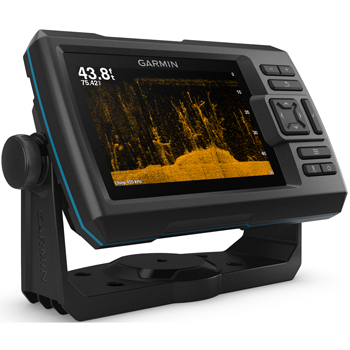 Garmin Tilt/Swivel Mount for STRIKER 5dv, 5cv, 7dv and STRIKER Plus 5cv,7cv and 7sv Series Fishfinders.